I honestly can’t remember the first time I met Catriona Smart. It must’ve been at a Nike Training Club sesh 3 years ago now. Yet though our paths crossed quite a bit over the years, it wasn’t until around this time last year that I plucked up the courage to ask her to grab a coffee with me. What inspired me to reach out was her blog post, 21 Things I Wish I Knew At 21. It was a beautifully simple yet poignant way to reveal not only a ton of wisdom, but also that she was going through a divorce with the father of her daughter after 14 years together. At this time, I too was struggling with my own marriage and needed perspective, but no one around me could relate exactly to what I was going through. Catriona did and she graciously accepted my cry for help. I’d always looked up to her, but for her to take time to sit down with me and talk about such personal experiences was faith-affirming. The conversation touched a lot of topics, not only relationships. It was then and there that I was truly inspired. I’ve since looked to her as a model business woman in this industry. To use a platform to do better and greater things is always admirable, especially the way she does it with kindness, charity and a disregard of what could be crippling fear in the face of pursuing your passion. I might not have asked her to be my official mentor — I would argue I have many mentors for various parts of my life — but I definitely consider her one. It’s important to have a role model to look up to, someone you can talk to for perspective, advice and even counsel. It can be daunting to reach out to someone you admire, but so long as you do it from a genuine place, no one would see it as anything but the deepest compliment. To show Catriona how grateful I am for her help, I surprised my mentor with a delicious heart-shaped pizza from Boston Pizza. 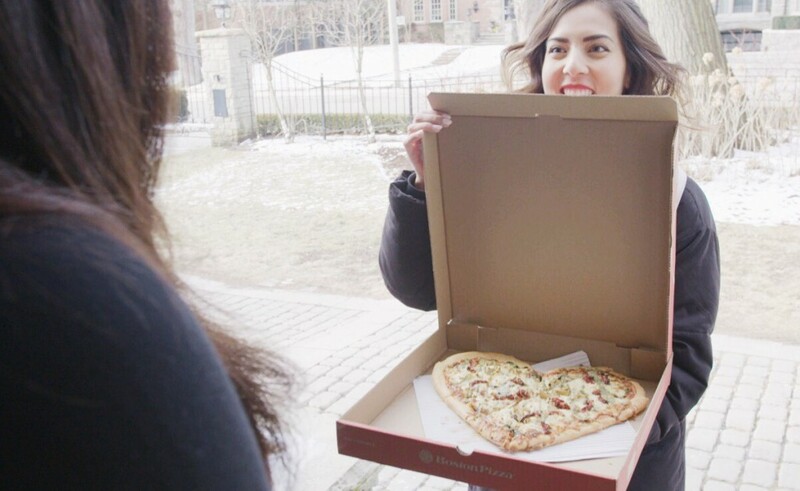 This meaningful gift, however, goes beyond its yummy ingredients: $1 of every heart-shaped pizza, as well as Future Prospects dessert, sold on February 14th supports Boston Pizza Foundation Future Prospects. Additionally, a $2 donation towards a paper heart will give you $5 off your next meal. All donations go directly to the Foundation. What is the Boston Pizza Foundation Future Prospects program? Created in 2014, it focuses on providing Canadian kids in need with role models in their community through organizations like Big Brothers Big Sisters, Kids Help Phone, JDRF, Live Different and other programs that mentor kids to their full potential.